It seemed a bad enough year for aviation but it could be worse as another airplane went missing. 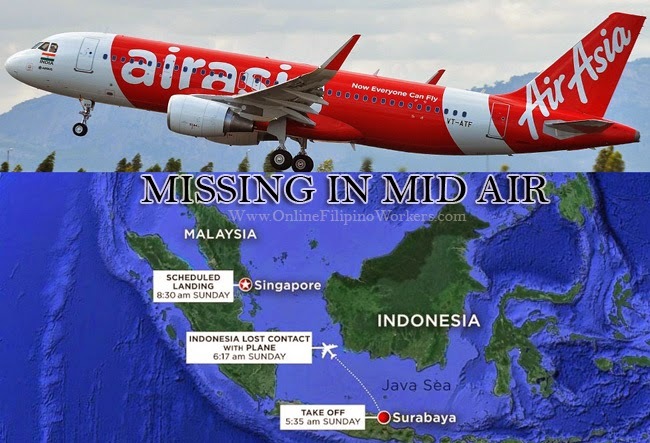 AirAsia flight number QZ 8501 had been reported missing at 6:17 am, on December 28. The said aircraft was containing 162 people, seven of which are crew members, 138 adult passengers, 16 child passengers and a baby. 149 of the passengers were Indonesians nationals, three were South Koreans, one Malaysian, one Singaporean and one Briton. Six of the crew were Indonesians while one was a French National. The flight left from Indonesia and was set to land in Singapore at 8:30 am. However, at 6:13 am, the pilot asked ‘to avoid clouds by turning left and going higher to 34,000 feet’. At 6:16 am, it was still seen on radar but disappeared a minute later. Search and rescue operation were done over the Java Sea but was suspended about 5:30 pm due to darkness and bad weather. They are set to resume on Monday morning. Relatives of the passengers from the missing flight had flocked to Changi Airport in Singapore while waiting for any updates from the missing aircraft. Air Asia had already released an official statement regarding the incident, citing that the pilot in command had a total of 6,100 flying hours, and the airplane underwent its last scheduled maintenance on November 16. It could be recalled that just last March this year, another aircraft, the MH370 from Malaysia Airlines went missing on the southern Indian Ocean. It was carrying 239 people, and although some debris were discovered by Australia, the aircraft or any bodies of passengers were never found. Authorities are not dismissing the possibility that the plane had crashed due to bad weather but still say that it is unlikely since the aircraft was only six years old.